Looking for a lightweight, portable BRAT generator? Contact us and we'll be pleased to help you order the right one! IPS-BR3000GC Brat Series 3000 Watt Generator, 4.6 HP, Honda GC160 Engine, 1.1 hours run time @ 50% load. 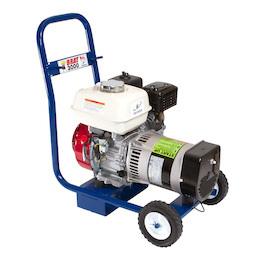 IPS-BR3000 Brat Series 3000 Watt Generator, 4.8 HP, Honda GX160 Engine, Oil Alert, 2.1 hours run time @ 50% load. IPS-BR5000 Brat Series 5000 Watt Generator, 8.5 HP, Honda GX270 Engine, Oil Alert, 2.14 hours run time @ 50% load. DXGN4500 4500 Watt Generator, Honda GX270 Engine, Auto Shut-Off, 15 hours run time @ 50% load. DXGN6000 6000 Watt Generator, Honda GX340 Engine, Auto Shut-Off, 14 hours run time @ 50% load. DXGN7200 7200 Watt Generator Honda GX390 Engine, Auto Shut-Off, 13 hours run time @ 50% load. DXGN14000 14000 Watt Generator, Honda GX630 Engine, Auto Shut-Off, 8 hours run time @ 50% load.